I've been going out solo-hiking for the last couple of years. The difference between hiking with someone else, and hiking alone, is that you do have to be a little more organised. I like to know where I can park or how to get to the start of the hike from the train station, (roughly) what hike I'm doing and how long it is, and whether there'll be anywhere to stop for food and water along the way. At first I used to get nervous when heading out alone. I'd take my dog for company which was a little more reassuring, but Oslo can't read a map or call for help if I fall over and hurt myself. Of course, the more I have hiked alone, the more comfortable I've become with trusting myself and my own experiences to know what to do if something goes wrong - if I get lost or run out of water on a hot day, or end up having to bail out in the middle of a hike at sunset because I greatly under-estimated how long the hike would actually take. Yep, all these things have happened before. And they've all worked out ok in the end. But part of that reassurance is knowing you have the right gear in your backpack; things like a phone with battery, enough water and food, and some cash just in case are essential. So if you're planning some solo day-hikes, here's my Gear List for what to pack in your rucksack for a day out in the hills. Of course, your exact gear list will all depend on where you're going and how experienced you are - for example, I'd pack a little differently for a ramble in the Peaks than for a solo-hike up a Munro in Scotland. I'm pretty confident with navigating in the Peak District - there's usually people around, phone service not far away, and a village within sight. Packing for somewhere more wild should be more considered. What I'm trying to say is, do bear in mind my packing list, but it's your responsibility to make sure you have everything you need! If you're new to hiking or solo-hiking, I'd recommend starting with some easy day-hikes then building up to bigger days out in the hills. Happy hiking! When I first started hiking, I just used my old uni backpack. The one I carried in my pannier bags when I cycled around New Zealand, and used on every hike when roadtripping in America. It's nothing special. A Kathmandu Unisac covered in patches and badges, with one of the straps re-sewn on. The bottom is a little worn out and it doesn't have a chest or waist strap. But it did the job, and carried everything I needed for a day out hiking. Now, I've ventured into the realm of more technical hiking packs. My latest favourite is the Patagonia Nine Trails pack. Mine is 26L because I wanted a bag big enough for a full day out in the hills, and to carry all my camera gear. The difference between the Nine Trails and my old Unisac is pretty massive. The Nine Trails has both a waist and chest strap (with pockets in the waist strap which I love), reinforced back padding, a stretchy mesh pocket at the front for carrying your map or stuffing a raincoat into, two water bottle holders in the sides, and space for a hydration system. It's ideal for big days in the hills. It's also specifically designed for women which means it fits my back perfectly, and is so comfortable for hiking. If you're after a technical hiking bag, I'd highly recommend the Nine Trails. But if you're just starting out hiking, you don't necessarily need a £100+ bag. I'd suggest finding a bag that's comfortable, ideally with good back padding, a waist strap and water bottle holders - these are things that I find essential! Making sure you have enough food and water is really important. When I hiked Snowdon a couple of summers ago, I stupidly only took one 500ml bottle of water for me and my dog to share. It was around 25 degrees and the hike took over 4 hours. Needless to say, I was desperate for a drink by the time I got back to my car and ended up with a splitting headache all the way home - not ideal! Of course, water is heavy but it's essential. Decide how much you need based on your hike. I'd recommend trying to drink at least a litre in the hour or so before you set off, and a litre per hour of hiking - especially when the weather is hot! Hydration is really, really important. When I was hiking at altitude in Nepal, I was drinking about a litre per hour, and weeing accordingly. I find hydration packs great to encourage you to drink, especially when hiking alone as it means you don't have to stop to get your water bottle out. I have an Osprey 2 litre hydration pack which is great. For shorter hikes, I love my Patagonia Kleen Kanteen flask or my Hydroflask. It's nice to take a flask of hot water out in the winter, when drinking cold water isn't appealing. Food, of course, is also essential when hiking. I'm pretty old school and tend to take a sandwich of some sort, some fruit, normally a pack of haribo, maybe the odd cereal bar, and dried mango - my favourite hiking snack! I've recently been trying out Veloforte's nutrition bars which I really love. Designed for cyclists, they're packed with natural ingredients and flavours and taste really good. If there's a cafe along the way, why not stop for lunch? Nothing beats a pub lunch in the middle of a hike! Being an avid photographer, I almost always take my camera out on a hike. I actually find it really hard not to... it's something I'm working on! I used to shoot solely on film, always taking my little Canon AE-1 out into the hills, with an extra roll of film. Around a year ago I switched to digital and got a Canon 6D. The 6D is the little brother of the 5D, which is what most professional photographer's use. The 6D is marginally smaller and lighter than the 5D; a full frame camera with a few less features, and therefore considerably cheaper. It's still an expensive camera, but is one I would highly recommend if you're looking for a DSLR to step into more serious photography. The second number, the 4.0/1.4 refers to aperture. Aperture means how much light gets in, and how much light gets in changes how much of the shot is in focus, and how much is blurred. So the lower the aperture, the less light gets in, which means the less of the photo is in focus and the more is blurred... does that make sense? This was all sooo confusing to me at first, but I think I've just about got my head around it! My 50mm lens has a really small aperture, which means I can get great detail shots of things like flowers, logos on clothing, and portraits. As a general rule, for a landscape shot I almost always have the aperture on 8 and use the 24-70mm lens for a wider image, with everything in focus. For a portrait, I like using the 50mm lens with the aperture at around 2.8 so just the person is in focus and the background is blurred. If I really want to capture something like one flower, I'll put the aperture even lower. I'm still learning and trying new things with all of this. I have the camera itself set on AV mode, which means aperture priority. So I only change the aperture, and the camera does everything else automatically. As well as the camera and two lenses (whichever lens isn't in the camera is packed into a woolly sock - so pro), I also take a a spare memory card, always use my Topo Designs rope camera strap, and recently acquired a Manfrotto camera case (in the top image) which I'll sometimes take in my bag on a hike so my camera stays safe when packed away - although my camera is almost always slung over my shoulder when hiking. My camera battery is really good, so if I charge it the night before, I don't need to bring a spare. Extra layers are essential, even in the summer. I always take an insulation layer (i.e. a down/synthetic jacket or fleece) and a wind/waterproof coat. It's often also worth taking a woolly hat and a pair of gloves, and in the winter I usually have all that plus an extra base-layer or two - I don't like being cold. 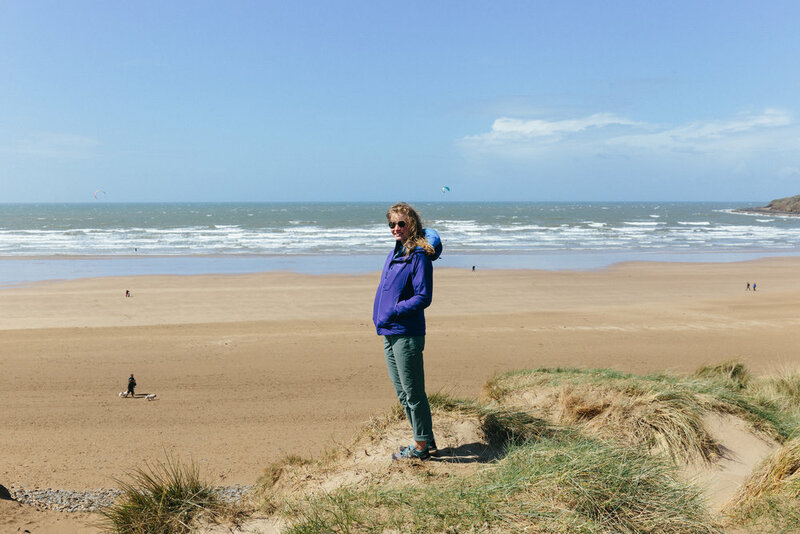 At the moment, my hiking bag always contains my Patagonia Rainshadow coat which I love for a few different reasons. Firstly, it's 100% waterproof and windproof; secondly it's an amazingly soft, stretchy material that makes it also great for climbing (two birds, one stone); and thirdly, it packs down to a tiny little triangle around the size of my foot. Likewise, I also recently acquired a Patagonia Micro Puff , their best warm-to-weight ratio jacket. The Micro Puff weights basically nothing (a mere 200g), packs incredibly small, but is as warm as a down jacket. I love having these two items in my bag and hardly realising they're there, until the moment the heaven's open or there's a severe wind-chill at the top of a hill and they're immediately on my body keeping me warm and dry. 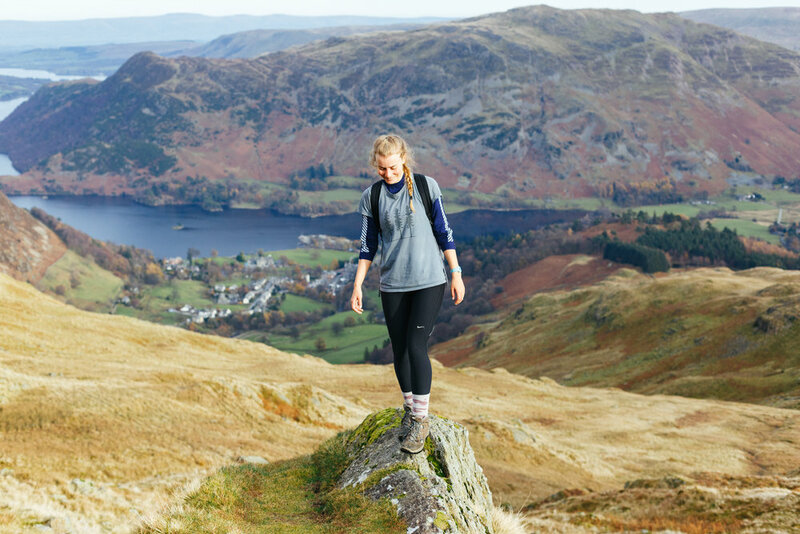 Again, you don't need to spend hundreds of pounds on expensive kit, but I would say that if you're starting to take hiking more seriously, it's worth investing in good quality items that will last a lifetime. I also love Patagonia's ethics; buying from them is good for the planet. Don't forget your map! I always use OS Maps as they're accurate, easy to use, and you can find them basically anywhere. Sometimes it's worth taking a compass (I'd recommend Silva) as well if navigation might be difficult. I'm not amazing at navigating, I've never taken a course or anything, but I can read the basics on a map. I've never been anywhere off-the-beaten-track enough alone to need to know compass skills, though I always seem to carry one anyway... just in case! I also have the OS App on my phone which I find really useful. You can use the app to plots routes in advance, download so they're available offline, and follow when you're in the hills. It allows you to know you're on track, which is great if you're heading out solo. That big white thing in the top photo is my phone charger. Yep, that's right. It weighs a ton. The weight doesn't really bother me though. Thanks to my shocking iPhone battery, I carry it with me everywhere. It is an Aukey 20,000mhz charger and when fully charged (which can take around 24 hours), it lasts up to two weeks (if used frugally). The phone charger is essential for me when hiking solo. I hate being without battery; I'd hate to get stuck without a phone. Of course, you can get lighter and less powerful chargers, but I find this one great for travelling and long backpacking trips, as well as day-hikes. I'm rarely caught without phone battery. My phone also dies in the cold, so in winter it's almost permanently plugged in! This isn't something that I ever used to think about, but after getting caught out in the dark on a rocky descent from Helvellyn onece, I'll often chuck my headtorch into my bag if I'm going hiking for a full day - especially in winter. I have a Petzl Actik headtorch which can be re-charged with either batteries or USB. I usually carry a little notebook and pencil around in case I want to sit down and write a little when out on a walk. Or sometimes if I'm doing a guide for Ramble Guides, I'll write directional notes so I don't forget. The little notebook in the top photo is from Alfie's Studio. It's sometimes worth packing a few first aid items if you're heading out for a big hill-walk. The essentials would be blister plasters, a small bandage, paracetamol/ibroprofen, mosquito repellent and water purification tablets. You can usually fit all these into a little sandwich bag and hardly notice it in your bag. You might also want a safety blanket or shelter, duct tape, and a pen knife. I don't always take all this gear, it completely depends on the hike. I have this all packed at home into a little zip bag, so I can chuck it into my rucksack if I need it. And finally, check the weather forecast and think about what extra items you might need in your bag. If it's raining, bring waterproof trousers and a coat. If it's cold, bring spare baselayers, gloves and a woolly hat. If it's hot, bring sunglasses, suncream and a cap. And lip-balm, always lip-balm. No matter the weather. I hope I haven't forgotten anything from what turned out to be a pretty long list. As I've kept reiterating, I don't always take all this gear. 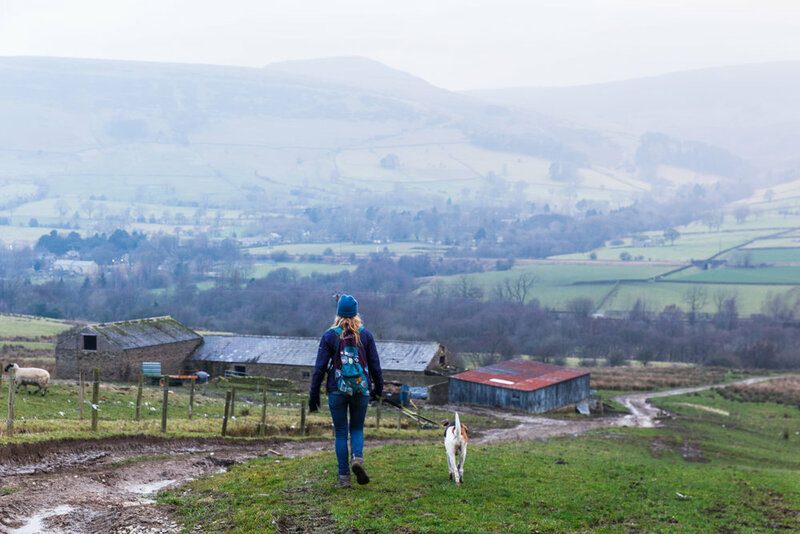 If I'm going for a little ramble in the Peak District, I might pack really light, whereas if I'm going for a full-day winter walk in Scotland, I'll probably have a full, heavy backpack. Make sure you're always thinking ahead about every scenario and packing accordingly, but more importantly, have fun! Check out my website Ramble Guides for some hiking inspiration. I recently put up my first full walking guide to Place Fell in the Lake District and would love some feedback.